Diplomate, American Board of Veterinary Practitioners. Certified in Canine and Feline Practice since 1997, re-certified in 2006. "What is this?" you ask. In human medicine, most doctors are "board certified." They've done additional training beyond medical school, they have specialized in either primary care, which includes pediatrics, internal medicine, family practice, and OB/GYN, or they've specialized in something like surgery, neurology, dermatology, or any of the other specialties that treat just one kind of problem. Once they've been trained and passed the test and written their papers and have done all they have to do, then they are "board certified" by the organizing group in their specialty, by the "board." In veterinary medicine we basically have the same system, except that specialists are not nearly as common. Most of us are general practitioners. The few specialists, or "diplomates," that do exist in veterinary medicine are mostly trained in specific disciplines, like surgery or cardiology or oncology. There is, however, a specialty board for primary care practitioners. It's called "The American Board of Veterinary Practitioners." That's what I'm board certified in. If you want to know more, you can give this a look. Veterinarian and Owner, St Francis Veterinary Group, a house call practice for dogs and cats, Tucson, Arizona. Veterinarian, Greenway Pet Clinic, Tucson, Arizona. September 2003 - September 2005. 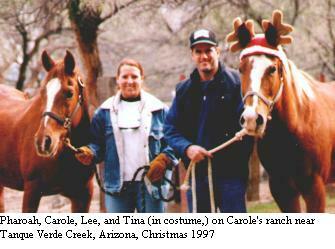 I spent two years in practice with my friend and former veterinary school classmate Dr. Carole Treat at her practice on Tucson's east side. Assistant Professor, College of Veterinary Medicine, The Ohio State University, Columbus, Ohio. January 2002 - December 2002. It had long been a dream of mine to be a part of academia. I was honored to be able to participate in the training of the world's future veterinarians. At Ohio State, I practiced and taught general clinical small animal medicine and out-patient surgery to the senior veterinary students. Veterinarian, Ina Road Animal Hospital, Tucson, Arizona. November 1999 - September 2001. I practiced primarily emergency medicine and surgery in a lovely hospital with Dr. Chris Miller. This was a special treat for me, since Dr. Miller was an early mentor of mine back when he first started practice and I was an undergraduate at the University of Arizona. Chris had a very high-tech place -- in addition to a nice surgery, lab, and X-ray equipment, which most hospitals have, he had video-endoscopes, ultrasound, a blood coagulation profile machine, surgery laser, blood pressure monitoring equipment, and an end-expiratory CO2 monitor. Hospital Director, Wiseman Animal Hospital, Tucson, Arizona. October 1990 - January 1999. I practiced medicine and surgery and had overall responsibility for the day to day workings of a large, full service veterinary hospital, one of the few hospitals certified by the elite American Animal Hospital Association. Wiseman was part of a 3 hospital, 10 doctor group that included 7 board-certified specialists; 5 ABVP diplomates, 1 surgeon, and 1 dermatologist. Wiseman was where I got the lion's share of my post-graduate training; I was fortunate to have the guidance of Dr. Joe Trueba and of the man who was one of my best teachers ever, Dr. Brett Hinsch. Veterinarian, Animal Emergency Service, Tucson, Arizona. October 1989 - October 1990. My second job in practice was here, a 100% after-hours emergency and critical care practice. I worked mostly nights and was guided by the incomparable Dr. Judy Parker, now board certified in the ABVP, who worked at the practice during the day and then answered her phone to talk me through countless cases at 3 o'clock in the morning. Veterinarian, Mountain Vista Animal Hospital, Las Vegas, Nevada. July 1988 - October 1989. Somehow I got into the good graces of the chief of the ICU and head of the cardiology department at Colorado State University while I was a student there, and he arranged for me to get this, an informal internship. My mentor here was Dr. Bill Taylor, also now board certified by the ABVP. No young vet could ever wish for a wiser, kinder, more accomplished practitioner with whom to spend his first 1 1/2 years in practice. If it hadn't been for the legal requirement for me to return to Arizona, I would never have left his practice. In spite of the fact that it's in Vegas. Other paid employment, the details of which I'll spare you, has included soldier (Sergeant, U. S. Army, 1976 - 1979), Korean and Spanish translator for the Department of Defense, underground miner, newspaper delivery boy, waiter, busboy, service station attendant, auto-mechanic apprentice, forklift operator, lawn-care technician, broom and shovel operator, grocery store stocker, truck driver, farm-worker (combine driver, hay stacker, fence and equipment repair,) and fishing boat oarsman. I am licensed to practice veterinary medicine in Arizona. I am a member of the American Veterinary Medical Association and the American Board of Veterinary Practitioners. Since starting my own practice (which keeps me quite busy) and getting married (which keeps me quite happy), about all I do with the community is a bit of singing. These days I sing with Awenrising and The Tucson Symphony Chorus. In other times, I sang with The Tucson Chamber Artists, The Arizona Repertory Singers, The Columbus, Ohio, Symphony Chorus and The Washington Square Chorus in New York City, as well as various garage bands, folk acts, musical theater, a bluegrass band, and about 10 church choirs. I've done a bit of community service here in town, volunteering with the following organizations. I also have another website, mainly full of family vacation pictures. Back to About Dr. Fike.